Some people are so rude—and I refer to myself. 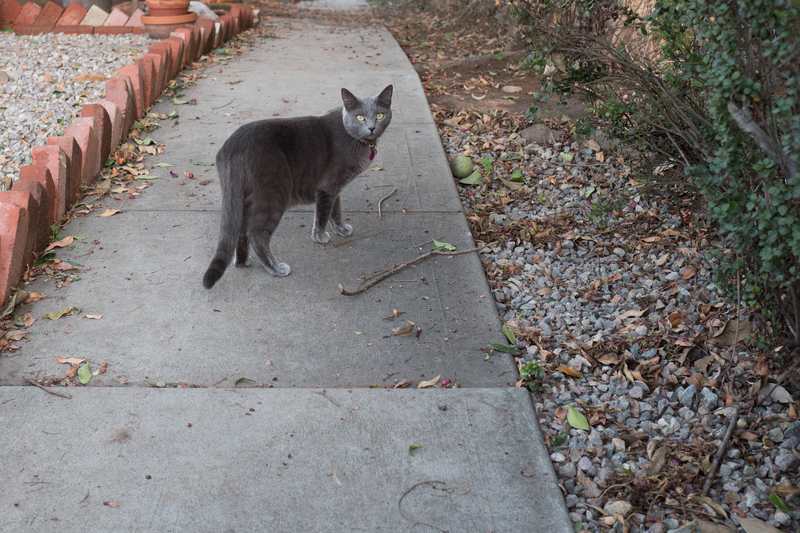 On Jan. 13, 2018, as my wife and I walked along Mississippi Street between Meade and Monroe, we spotted a pretty, grey kitty about half-way down the block. 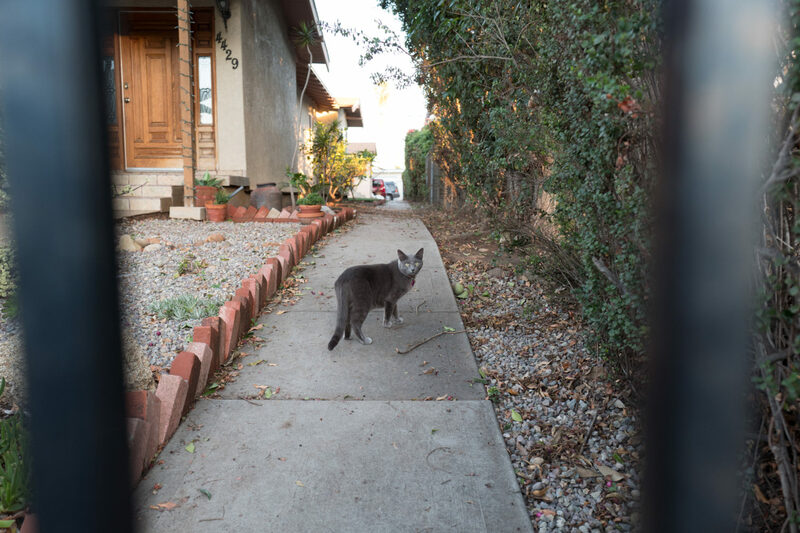 As we approached, the shorthair moved around a car in the street, later going back to the sidewalk, then passing through the door-fence bars into a yard. I took out Leica Q and started snapping portraits. About three minutes after the photo shooting started, with a dog barking loudly inside the house, a man came out to see what caused the ruckus. I explained, although with camera in hand my purpose was obvious. He shouted—to get above the barking—that the beastie was “the neighbor’s cat”. Someone perhaps more polite would have stopped there, to give the gent relief from the yapper inside the house. But I pressed, asking for a name. “Hanna!” he yelled. I thanked him and moved along. Yes, but is that with an “h” at the end? If only I could have read the collar tag. Either I misunderstood, or he had her name wrong (more likely my mistake). 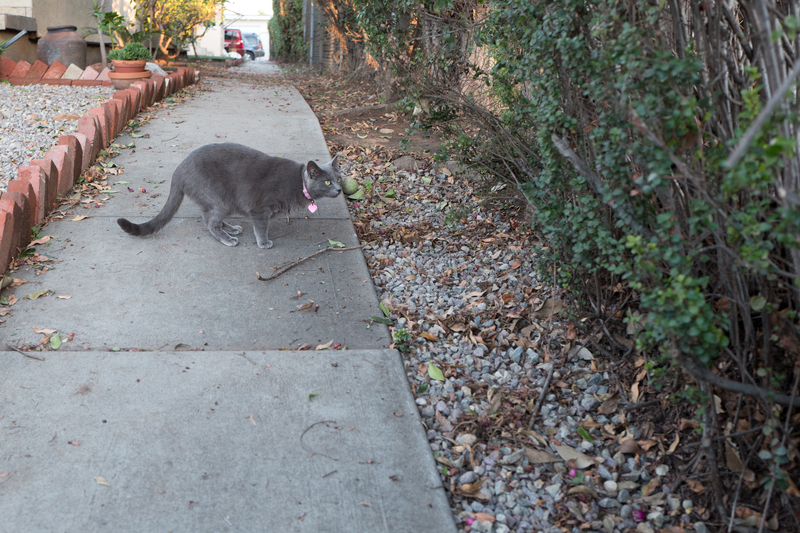 While walking down Alabama Street five days later, at Mission I passed a couple with a baby, dog, and grey cat. I recognized the pink collar and stopped to ask. Sure enough, this was the same kitty, but she is Ohana, which is Hawaiian for family. The dad says that she likes to follow along, so he carried her. Confirmed: They live on Mississippi. Ohana is the fourth grey featured within a block radius. There is Amanda, whom I first sighted on Meade between Alabama and Florida and more recently—about two weeks ago—on the same avenue between Alabama and Mississippi. Around the corner on Alabama, and the same 4400 block as next street over Mississippi, live Laramie and Smokey. I shot the Featured Image through, but outside, the bars at 4:44 p.m. PST, or 20 minutes before sunset. Vitals, aperture manually set: f/4, ISO 640, 1/125 sec, 28mm. The second photo is the original, with blurry bars visible. I used the Q’s fantastic manual-focus ring for the principal pic and final one. The last portrait catches Ohana hunting posed, after spotting a bird in the bush. Vitals: f/4, ISO 400, 1/60 sec, 28mm. For this one, I pushed the camera lens beyond the bars. More meow-meows: Scruffy, Roly Poly, Woo, Skull, Biscuit, The Colonel, White, Chipper, Frisky, Stretch, Needy, Farfisa, Mates, Hunter, Pee-Pee, Blue, Blue Too, Bonded Pair, Patience, Fess, Jumper, Frenemy, Looker, Cozy, Scout, Lurks, Skit, Mini, Betty, Black and White, Stalker, Bell, Chill, Sammy, Scratch, Poser, Star, Grey and White, Watcher, Herman, Comet, Roman, Willow, Chub, Nimbus, Watson, Lilo, Kit, Pepe, Twilight, Sebastian, Spot, Booger, Ash, Veruca, Riley, Mellow, Bonde, Flower, Glass, Black, BeBe, Fang, Bruce, Siamese, Pounce, Tortie, Haiku, Fraidy, Peso, Daniel Tiger, Dusk, Stride, Dainty, Spry,Tabby, Betty Too, Still, Levi, Shadow, Sophie, Wink, Ferals, Momma, Charlie, Tux, Cool, Benny, Jellicle, Itchy Valentino, Goldie, Nine, Amanda, Siesta, ChaCho, Charlie, Too, Mika, Crystal, Seeker, Mittens, Dancer, Smokey, Monkey, Captain Blackbeard, Season, Maven, Tink, Chunk, Curious, Hanoi, Bella, Tarry, Guido, Maxine, Mr. Kitty, Peohe, Panda, Frankie, Sunshine, Twain, Willow, Too, Brawn, Reddy, Burglar, Laramie, Lupe, Bright, Tom, Charm, Buddies, and Boss.